What kind of place do you live in? An apartment? Condo? Town house? Perhaps you’re two shakes shy of the Looney bin? I live in a house. It is a nice sized house with my aunt, my son and all of our hopes and dreams. I don’t think it really matters which one you occupy, because (with the exception of a ranch, farm or villa), we all have neighbors. You know, those people who live near us, around us and sometimes above or below us. As you might know by now, I like definitions, so let’s see what we find. Our first Neighbor. Mr. Rogers. Say it with me: naaaaaay-burr. Do you know your neighbors? Have you met or introduced yourselves to them? WHY NOT? Without attempting to know your neighbors you cannot live an all-inclusive happy life at home. Bear with me here and read what I have to say. Neighbors bring something to the table that shouldn’t be dismissed and that is comfort, security and possible friendship. They provide a valuable service that should not be disregarded. We should all get to know our neighbors. We should communicate with them and in special occasions, we should like and appreciate them. My grandma used to refer to a time when her family lived with unlocked doors. They lived in a rural area of Oklahoma and the only people around were not only known, but were welcome. She said they “had no reason” to lock the doors. Doesn’t that seem almost surreal? I have known such environments and even fostered one of my own. Growing up, the bestie’s house remained unlocked and still does during normal hours. And when I had my own apartment, in a very small complex, my front door was also unlocked during normal hours. It seems that as time passes and we become familiar with the events of the world, we start to fear the “possible”. Of course, we are always changed after a situation or tragedy. My aunt’s apartment was once broken into. She wasn’t home, she moved shortly thereafter, but she remains uneasy and uncomfortable. As most people do, which is entirely understandable. However, this is not about burglaries or other crimes. This is not about leaving your door unlocked. This is about simple neighbor maintenance. When you share a neighborhood, share streets and yards, you should share other things too. You don’t have to share your innermost things, just exercise kindness and courteousness because it can only serve to benefit you and yours in the future. So, are you ready to talk about being neighborly? Ok! Let’s do it. Welcome. Would you believe that when we moved into this house, our neighbors (and now our friends) welcomed us to the neighborhood with a plate of homemade cupcakes? Seriously. The lady of the house and her two little ones came over with big smiles, a warm hello and a plate of chocolate cupcakes. “We just wanted to welcome you guys to the neighborhood”. When was the last time you heard of someone doing that? Did someone do it for you? Have you done it for another? It was such a wonderful gesture. It was a few weeks later that I returned their plate with my own homemade goodies. We’ve continued this interaction for five years now. I’m so glad she started it. It certainly made us feel welcome. It sparked a neighbor-friendship that has grown and thrived throughout every day, week, month and year. We’ve shared ideas, recipes and I made her family true fans of Red Velvet cake. Smile. Yes, smile. It’s not hard, it’s not expensive and it goes a long way. Wave/Nod. When people look at you, wave. Or nod. If they wave to you, wave back. Or nod. It’s easy to establish boundaries and set the parameters of a potential relationship. You don’t have to invite them in for tea and cookies, just be cordial. Introduce yourself. You don’t have to share your life story, but just say “Hi. I’m Tanisha. Welcome.” If you feel uncomfortable with this, then just say “Hi. Welcome.” I cannot find a reasonable excuse to NOT say “Hi” to someone, but that’s just me. Maintenance. Take care of your home. If you can’t afford the upkeep, you should probably move. I know it sounds harsh, but don’t move into the white picket fence neighborhood and park a car on the lawn, let the grass dry up and allow the pool to turn into your own little bayou in the backyard. You tarnish the entire area. Again, I know it sounds harsh, but you need to be aware of where you’re moving and what you can maintain. If you can only afford to pay the internal bills and cannot afford the external maintenance, you’ve moved into the wrong area. Sad? Yes, but true. Landscape. If not, then landscape. There’s just no way around it. Hire a professional. If you can’t pay for it, do it yourself. If you can’t do either of those, check with your neighbors. Perhaps one of the local kids will mow the lawn or rake the leaves. Attempt! To match the yards around you. Pick your fruit. If you have fruit bearing trees, when they fruit, pick them. If you do not enjoy the fruit or do not know what to do with it, share it with your neighbors. The key point is to NOT allow your lemon tree to turn into a moldy festering pile of pseudo-lemons spoiling and oozing in your yard. It’s a waste, it’s unattractive, stinky and it attracts critters. No one wants critters. If you share your fruit, you are not entitled to the by-product. However, if you receive some fruit, you should share the by-product. It’s just the neighborly thing to do. Capicé? If none of these options is favorable to your taste, chop down the tree. Pick your papers. Do you receive the newspapers? Do you read them? Or do you leave them in the driveway to collect as if no one lives there? If you receive them, no one truly cares if you read them, collect the coupons or throw them in the trash, just do not leave them in the driveway. It doesn’t give an illusion, it’s a straight out statement: We. Don’t. Care. Pick UP after your dog. We, as a whole, really need to be conscious of our pets. Where I live, there are two rules to a dog. 1) in your yard or 2) on a leash. Anything beyond that is trouble for you. Also, where I live, you’re required to pick up after your dog. It’s your dog, it’s your responsibility and it is should not be the problem or the worry of your neighbors. Truly. I don’t have a dog, therefore, I do not want to pick up after a dog. Nor do I want your dog “watering” my plants and flowers. Please and thank you. I’d like to add my own twist in regards to spaying or neutering your pet. I am not a bleeding heart for every cat or dog. Nor any pet for that matter, but enough is enough. There are so many unwanted pets wandering the streets. If you do not want the worry and responsibility of caring for, getting shots for, naming and picking up after a litter of offspring, spay or neuter. If you’re not going to keep your pet in your yard or on a leash, spay or neuter. Please. Also, if you keep your dog in your yard never to be seen, you still need to pick up after it. A heaping pile of dog poo is nuclear in the summer heat. It’s better for all of us, especially your dog and anyone who lives downwind. Rare and/or dangerous pets are exactly that: rare and/or dangerous. Treat them as such. Check on them, double check on them and then check again. You run a huge risk having something rare and/or dangerous in your home. You run an unfathomable risk having something rare/or dangerous outside of your home. Be conscious of what you are exposing yourself and your neighbors to. If the risk is too high, return it or sell it. Prepare for parties. We all like parties, don’t we? My favorites are family oriented backyard hooplahs with lots of food, music, kids and fun. That’s what I like. My neighbors might not be so fond. If you’re going to have a party, be conscious of your party. Parties are unpredictable. Accept responsibility for your home, your guests and everything related and included. That means parking, drinking, smoking, laughing, yelling, fighting and eating. If you have a zero tolerance policy on any of the above, MAKE IT KNOWN to your guests before arrival. Keep your party at your house. Don’t let your guests wander the streets and disrupt your neighbors. Warn your guests about parking. You know where you live. If you live in a cul de sac, tell your guests. If you live on a one-way street, tell your guests. Give them an idea where to park and be certain to tell your guests to be mindful and respectful of your neighbors. Keep your bathroom stocked with necessities. Please. For all of us. In the event your party is spectacular (as we would all like for them to be) make sure you stay within your boundaries. If your boundaries find themselves expanded, make sure you conduct yourself accordingly. Here’s an example: my friend’s dad has a great party house. I’ve been there many times and stayed until wee hours of the morning. While out and about one night, he and the other bar-goers were having such a good time they didn’t want it to end. So, being the host that he is, he invited the bar back to his home. They kept the party going until well beyond reasonable. The next day, my friend’s dad purchased bottles of champagne and sparkling cider and personally delivered them to his neighbors with his sincerest apologies. His neighbors were not only surprised, they were appreciative and honored. He showed that he was conscious that they existed, could have been disturbed and that he wasn’t so much regretful as he was apologetic. It doesn’t mean it won’t happen again, but if it does, I’m sure they will be calm about it. Mind your music. Whether it’s from your home, your car, or your teenager’s garage band… mind your music. This is coming from a music lover! But the fact is, not everyone enjoys and appreciates music the way I do. And eve\n if they do love and appreciate it, our tastes and preferences are varied. Just be mindful. Not everyone wants to hear Nina Simone belt out “Where the Chilly Winds Don’t Blow” at the highest volume during the latest hours. Return what is not yours. Isn’t it amazing how a ball always ends up in the backyard? Kids. Give the ball back. Don’t keep it for your grandkids, don’t throw it away, give it back. Please. For some of us, that ball has been at our house for a total of 3.7 seconds and now it’s in your yard. Please return it or for the love of all things holy, or this boy (my boy) is going to rant, rave, scream and cry about it for the next week because he knows it’s in your yard. He doesn’t understand that I can’t just hop the fence, fight off your German shepherd and get the ball. So, please, just give it back. Thank you. The Pros. Now, when you’ve got neighbors that you know and trust, you have someone to pick up those papers when you’re vacationing, someone to check the mail for you, pull your trash out and to even hold a spare key in case both of you get locked out. You have someone from whom you can borrow milk or sugar when you’re in a jam. Someone to help you fix a flat, change a tire or get the sandbags off the leaky roof. You have a friend. 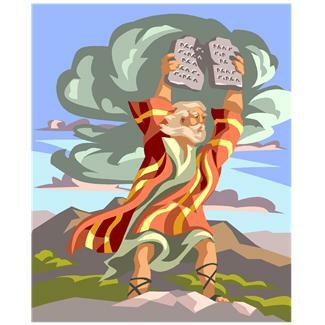 Moses.. receiving the Ten Commandments. Does that sound familiar to you at all? It should! It’s in the Bible. It’s concept is part of the Ten Commandments. The phrase itself is repeated and stressed many times over throughout the Bible. I believe it is the essential ingredient in the Golden Rule. You’re familiar with that concept aren’t you? Both of these concepts are older than anyone you or I have ever known. They have stood the test of time. These ideas have been used to devise laws and as a basis for punishments. They are key to the care and concern of the human spirit and mind and are representative of the status of the human condition. If you didn’t know it then, you can’t say you don’t know it now. Treat others as you would want them to treat you. Common courtesy. If that’s not enough, do it because God said so. I was going to end with “in short, what I’m saying is”, but as you have probably come to know, nothing I say is “short”. And what “I’m saying” is what I’ve said and what you read. I am a self-proclaimed non-expert on everything. I am not trained or certified in neighbor relations. I can only tell you that this neighborhood and these people are some of the nicest and friendliest I’ve ever known. The majority of them have introduced themselves at one time or another and always share a smile or a wave (except for that one lady who I hope somehow finds this website, blog and post and knows it’s about her). There is a couple that walks their dogs in the morning and we’ve only exchanged “hey howdys” and a little chatter about their dogs. But I wouldn’t be worried to ask them for a jump for my car, a cup of sugar or to use their phone. There are several seniors that walk in the morning and always seem anxious and eager to share their brisk morning smile and energetic waves. These people are technically strangers because I don’t know much beyond their walking routines. But, we share a common thread. We live in the same area, we share the same streets and zip code. We are neighbors. We should conduct ourselves as such. So should you.